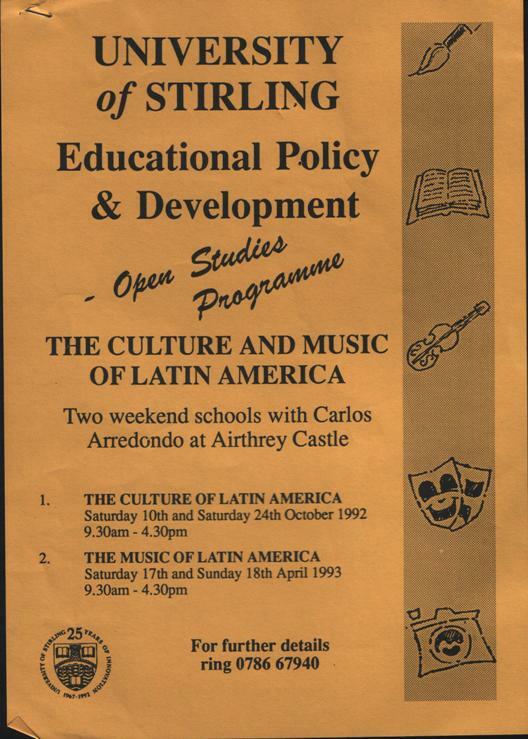 Until the 1980s I advocated my entire life in Scotland to the subject of Chile: its politics and its culture in the context of a bloody Pinochet dictatorship affecting The People of Chile for 18 years. 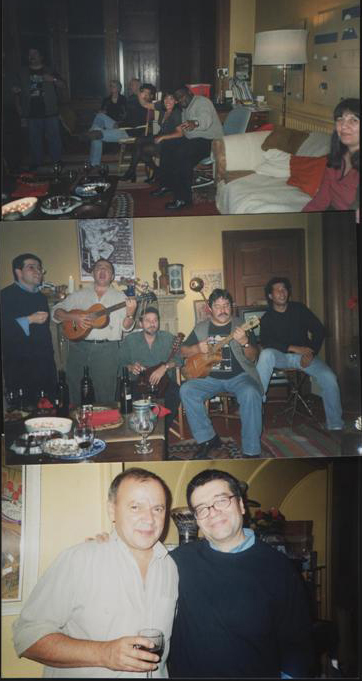 To play some guitar, a bit of imagination, a bit of courage and a political commitment was all what I need to do interesting things and meet interesting people. 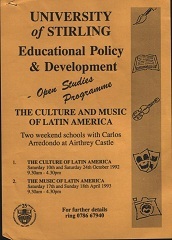 However, I have also worked hard promoting the culture of Latin America. 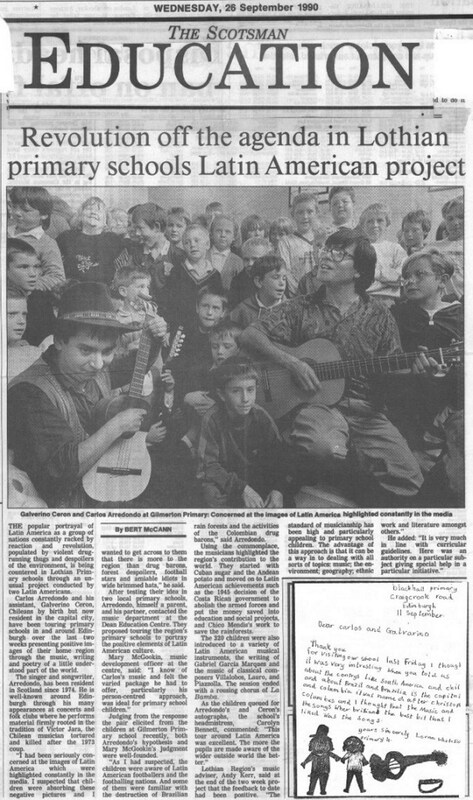 A very satisfying experience was to work, at times, with my fellow Chilean musician Galo Ceron in Schools, universities and children festivals. 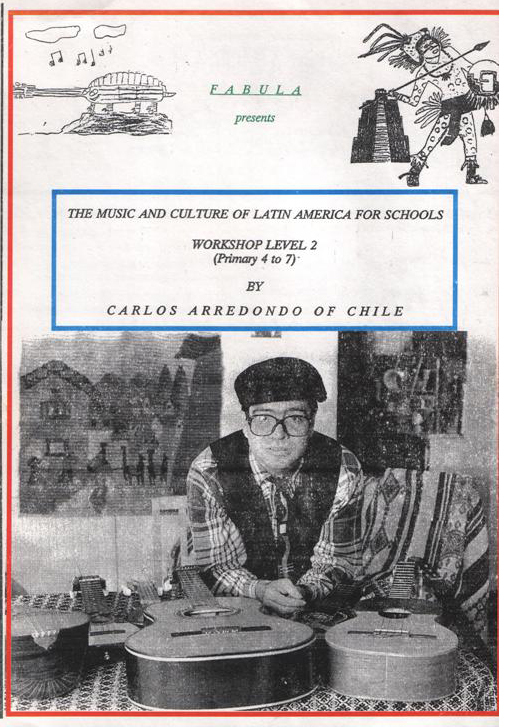 Back in the 1990s, as a way of doing some work to earn some money, I had the idea of presenting in educational establishments: primary, secondary schools and universities some didactic workshops based on Latin American culture including geography, topography, the flora and the fauna. Everything was done with my music. 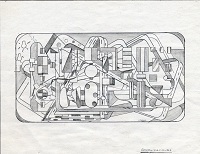 This type of work served me as a platform to study and prepared me to go to the Edinburgh University. 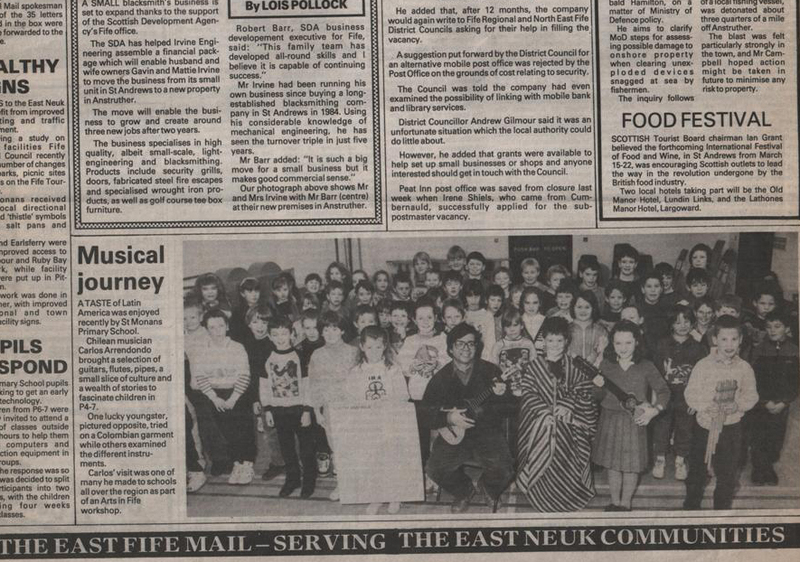 I graduated here in 1997.I was also used to be invited to play at Children festivals and on this capacity once I was invited, along with many artists, to a reception with Prince Philip at the Edinburgh City Chamber. At the reception, I was one of the interpreters between the Prince and some members of La Banda de la Risa (JA!,JA!,JA!) the excellent Argentinian Theatre Group. 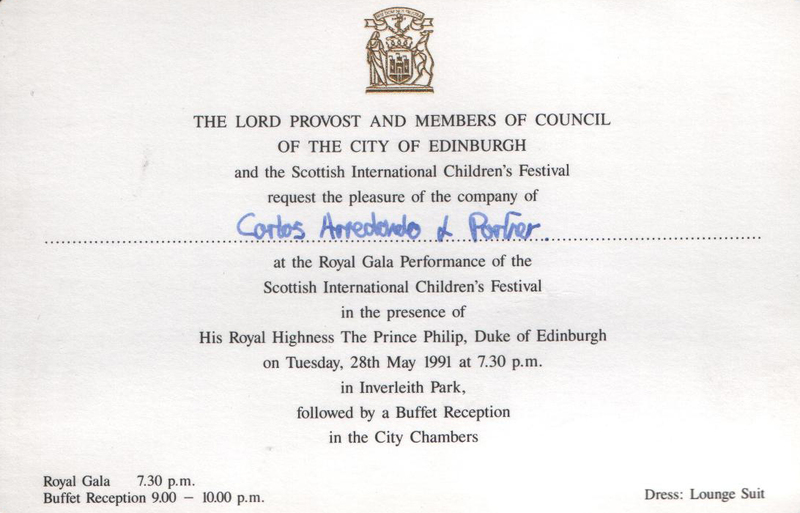 The Prince had come to see a Gala performance of Fausto by La Banda de la Risa at Inverleith Park. I have not doubt that it was a PR exercise because the Prince's visit took place after the Malvinas/Falkland war. For the things mentioned above and for the reasons listed below I realized that I have always been involved in cultural/political activities related either to Chile or Latin-America. This task allowed me to do exciting things and be in touch with interesting people involved in cultural work in Scotland. A great experience was to work with the great political theatre Co. The 7:84. We toured Britain and Canada and allowed me to get to know two great people: John McGrath and his wife Liz MacLennan. 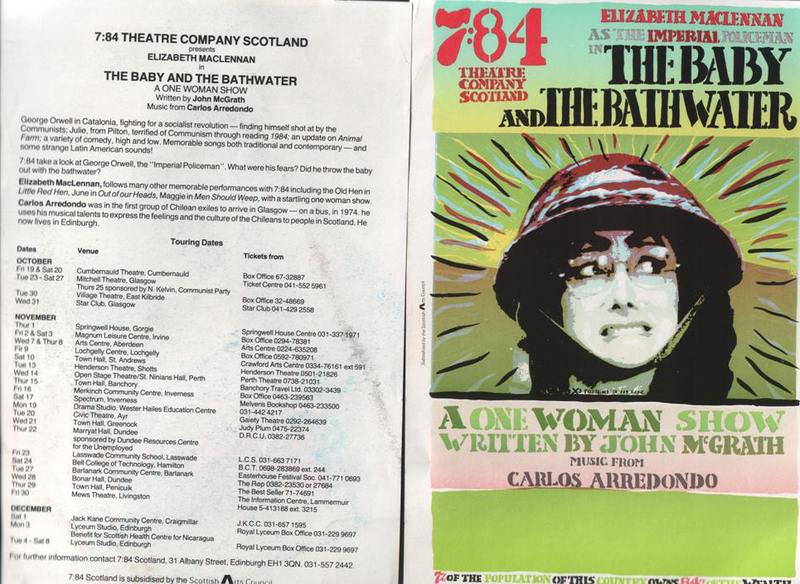 In 1984 the company needed someone to write songs and perform for a one woman show written by John and called: The baby and the Bathwater. John and Liz invited me to meet them at their flat and there they explained to me what was required of me not before telling me that they knew the Chilean actor Hugo Medina in those days living in exile in London. I accepted the challenge with happiness. I was about to enter a world where I had never been before, a very demanding theatre world which resulted for me in a unique and an invaluable experience. Works at times had been to help to organise in Edinburgh the concerts of famous Chileans bands and singers. Among them The Inti Illimani. 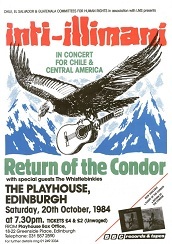 The group came several times to play for the Edinburgh Fringe Festival and my wife and I were always asked to help them with their concert. The band represented so much for our community of Chileans in Scotland and I got to know them well. In Fact, Horacio Duran in one of their presentation in our city, stayed in our home. I like them very much as they not only were fantastic musicians but because they were a bunch of very nice people. 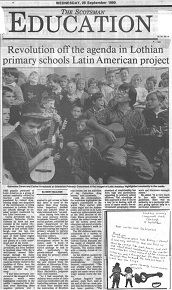 A person Who always supported my work and took part in Solidarity events for Chile was Hamish Henderson. 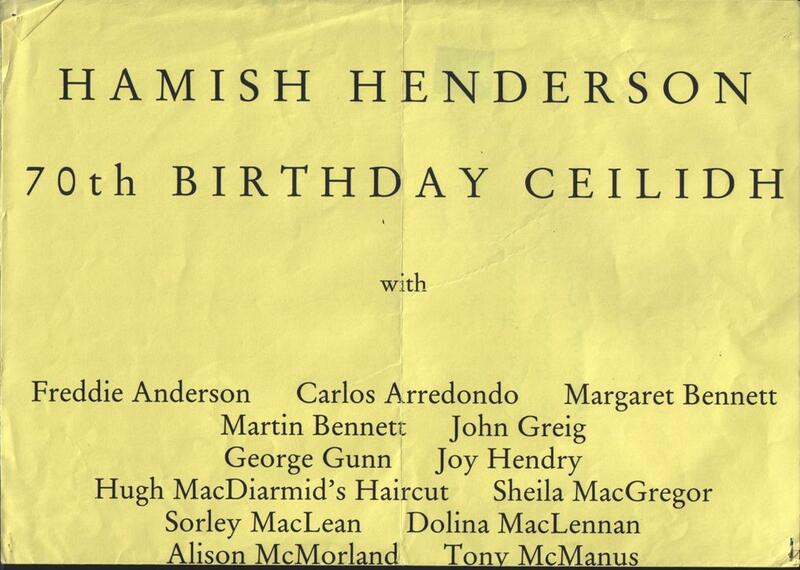 Hamish Henderson was once in my home for dinner conversing and singing old Italian Partisan songs to my Italian mother in law who was visiting us in edinburgh. Hamish had been during the war a British intelligence officer in Italy. My mother in law was surprised to see Hamish singing songs that she had learned during the war and was thrilled with the experience. Hamish loved Antonio Gramsci. He had been one of the first to translate his work from Italian into English. 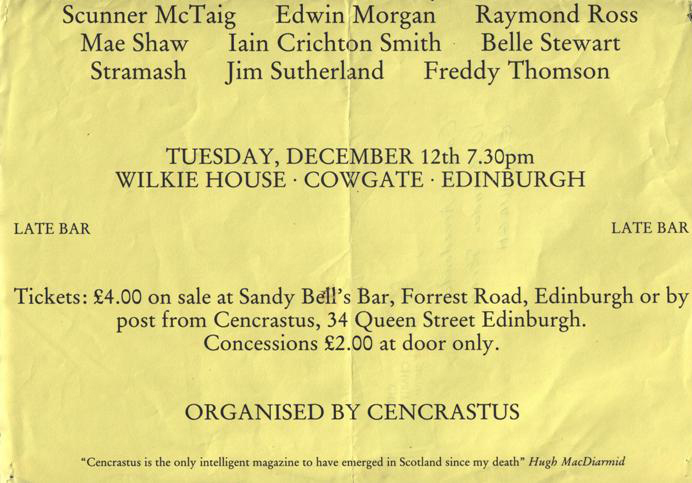 Hamish, the poet, the song collector, and composer of Freedom Come all-ye was a Socialist and a true internationalist. We shared a platform several times. 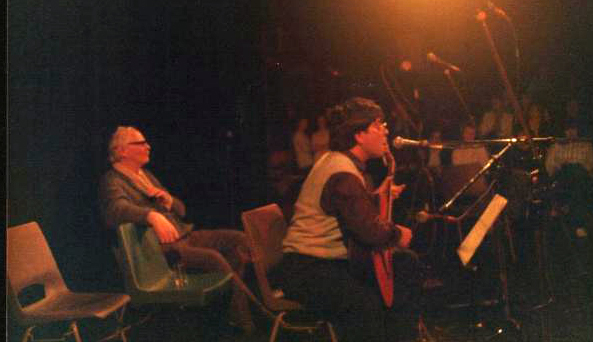 In 1986 I asked him if he could help me to find a record company to record my songs and he did. Only in 1989, however, I could record my songs. I asked him if he could write a few words about my record Debo Cantar Bonito and he ended up writing 3 pages full of beautiful things. 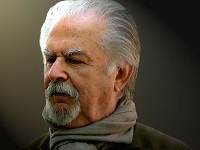 Maestro Fernando Botero was very kind to accept me for an interview . 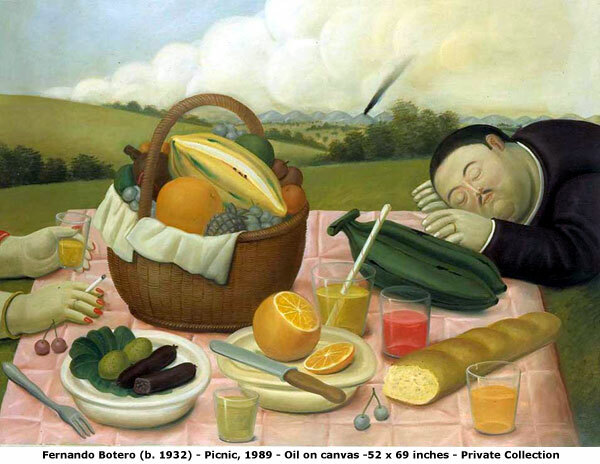 This was a weird meeting in which I, the interviewer, talk a lot instead of making Mr Botero to talk. (stupid me!) 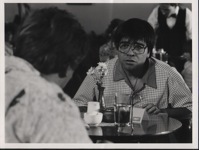 The setting was in a beautiful Italian Piazza around a table in a lovely coffee bar. Unfortunately, when I began to do the interview, it began to rain and not far from where we were sitting, a guy began to do some drilling work ruining in part the sound. What is important, however, is the fact that Maestro Botero was very kind to me. 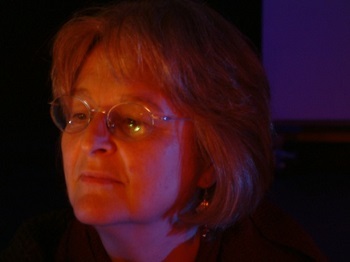 Below: A remarkable friend of mine was the English musicologist and journalist Jan Fairley. 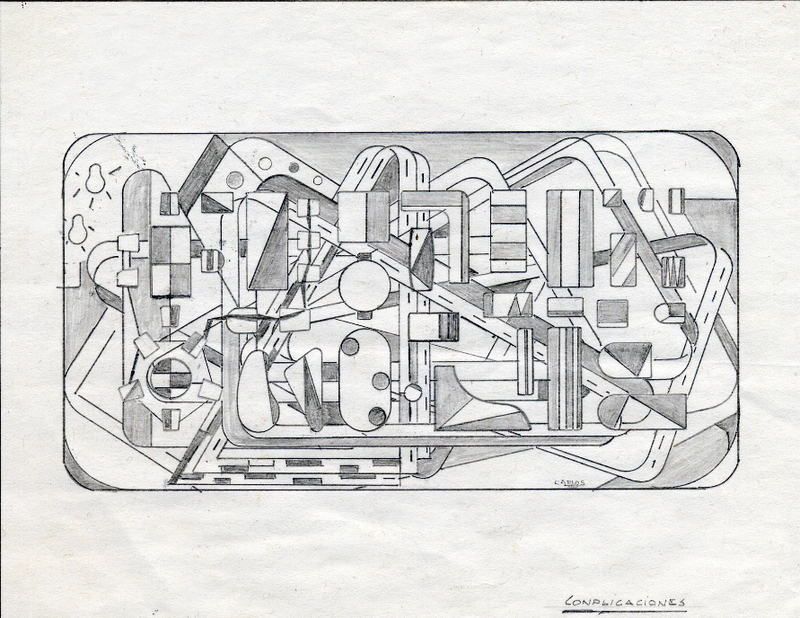 She was always a great supporter of my artistic activities. 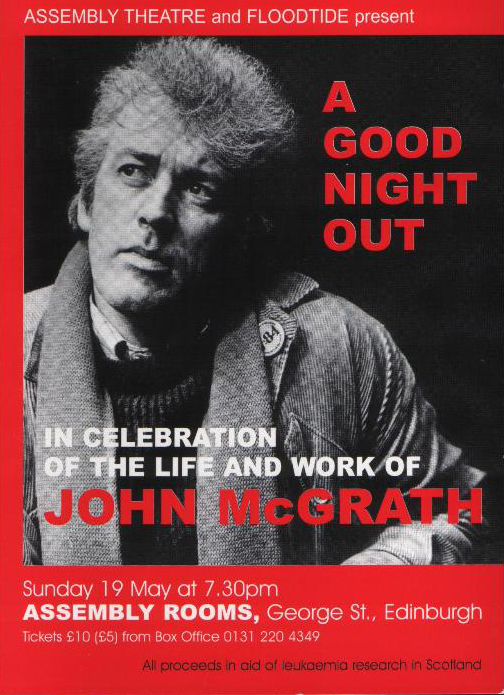 Jan was a powerful voice in Britain of the popular music of our world. "I am an experienced and passionate ethnomusicologist working as an arts and music journalist and broadcaster, writer and editor as well as researcher, lecturer, radio presenter and producer. I have a breadth of organising experience at home and abroad. I am a fluent Spanish speaker. I love travelling and have worked abroad (notably Chile 1971-3 and again in 1994) and researched in Cuba, Spain, Brazil, Argentina, Finland." Jan Fairley. Jan, loved Chile and the Chileans, was one of my dear friends in this country. Please visit her blog and see how interesting was Jan for all of us. She left us on the 9th of June of 2012. 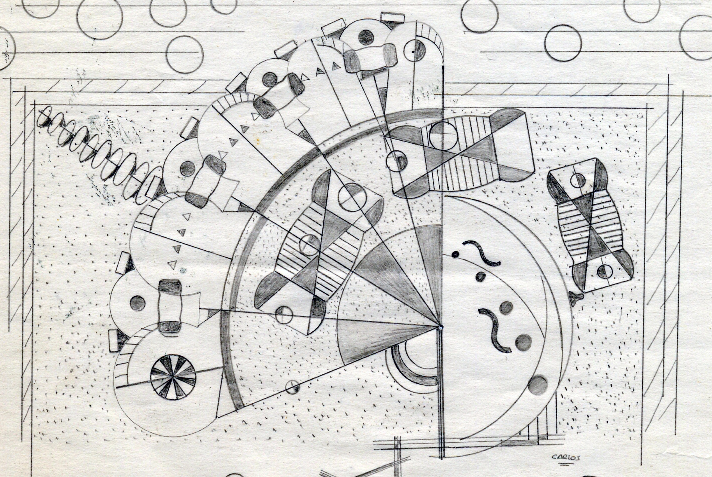 Years ago in Glasgow I did a couple of drawings which some of the motives on he left had been taken to design the pages of my website.